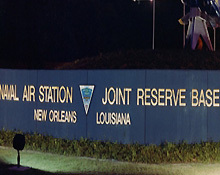 Naval Air Station Joint Reserve Base (NAS JRB) New Orleans is located adjacent to the powerful Mississippi River in Belle Chasse, Louisiana. Belle Chasse is a quiet and calm suburb, just minutes away from the culturally rich sights and sounds, that defines New Orleans. NAS JRB New Orleans community consists of service members and their families from the Navy, Marines, Air Force, Army, Coast Guard, and Louisiana Air National Guard, as well as civilian employees and retirees.